Last week one of the guys at work was up near Sydney for a charity event, and saw this sitting in the yard at the event. I believe it is a Saracen 8 man APC but I don't know the story behind why its there, as he didn't ask, just snapped a pic as he thought I might be interested. It would certainly be a great restoration project. I wonder if you could get it registered to drive on the road? Would sure be fun to reverse park. Some are/have been registered in VIC. In QLD they have to be registered under the conditional registration scheme. 8 cylinder Rolls Royce petrol I believe. We had a badly beaten-up one, at 5EME services Unit in the '80's. I saw one late last year with some young adults poking out of the various hatches on their way to their school formal. 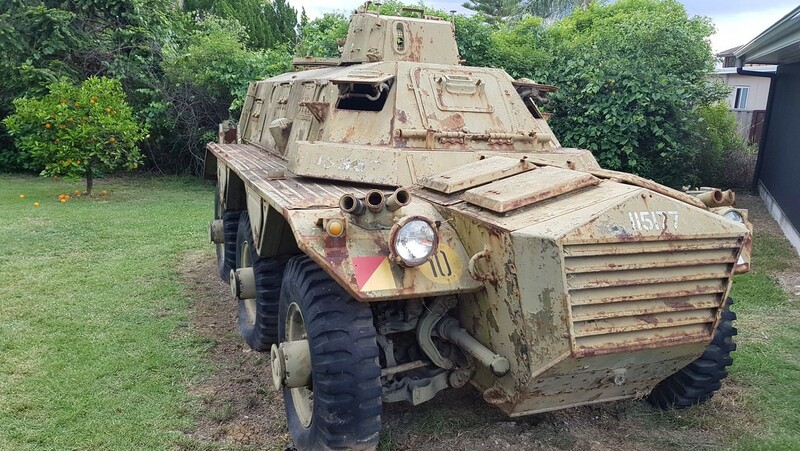 The APC looked to be in amazing condition.